Product prices and availability are accurate as of 2019-04-20 02:01:29 UTC and are subject to change. Any price and availability information displayed on http://www.amazon.com/ at the time of purchase will apply to the purchase of this product. A Premium Unbleached Honeycomb Natural Sea Sponge picked freshly from the Mediterranean Sea. The honeycomb sea sponge is the finest of all sponges. Its honeycomb structure feels luxurious on the skin while giving the sponge great durability. It is more absorbent than synthetic sponges and creates a nice lather during bathing. The sponge is very effective whether it's used for exfoliating or bathing, and is suitable for babies, children and adults alike. 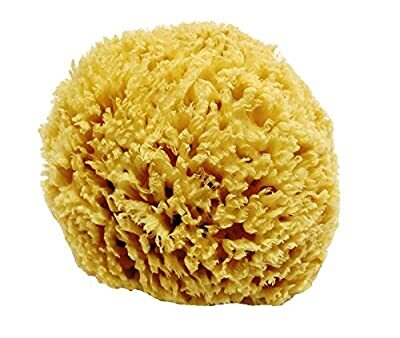 Standard yellow sponges are the result of being bleached of their natural brown colour. While this results in the popular yellow look, the sponge is known to lose some strength and durability. This particular sponge is not bleached and so retains its original colour and strength. When choosing a sponge size we recommend going for one which would sit comfortably in the palm of your hand. This usually means a size 5 inches or above for use by teens and adults. For use on babies and toddlers we advise going for the smaller size of 4 inches. Having said that, there is no hard and fast rule and you may well wish to start out with a small size if you've never used a natural sea sponge before and are looking to get a feel of it first before settling on your ideal size later on. As they were once living organisms, natural sea sponges tend to vary in shape and size. Our sea sponges are carefully curated so that the one you receive is rounded enough to be suitable for its use. Natural sea sponges also have a somewhat flat bottom, due to them being cut from the ocean floor, and this is the case with all sponges. The sponge is not bleached and so retains its orginal colour and strength. sponge has natural anti-bacterial and anti-fungal properties so will not go musty. Unlike a synthetic sponge no chemicals are used. It will last for many years without disintegrating Sponge becomes super soft when wet and will expand by up to 15% in size Suitable for both children and adults. It's uses include exfoliating, massaging and general cleansing.